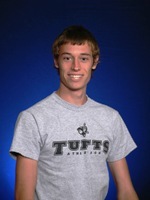 MEDFORD -- Four members of the 2007 Tufts University cross country teams finished among the top 14 at the New England Small College Athletic Conference (NESCAC) men's and women's championship races on Saturday (Oct. 27) in Williamstown, Massachusetts. By virtue of their finishes, those runners have earned All-NESCAC honors. 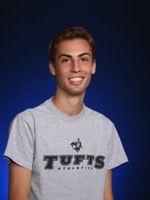 In the men's race, senior tri-captain Dave Sorensen (Dover, MA/Dover-Sherborn) finished in ninth place and sophomore Jesse Faller (Burlington, MA/Burlington) wasn't far behind in 12th place. They both made the All-NESCAC second team, which includes the second seven finishers in the race. Sorensen finished the eight-kilometer course in 26 minutes, 41 seconds, while Faller crossed the finish line with a 26:43 time. Their performances helped Tufts finish fifth out of 11 teams at the championship meet. Sorensen and Faller earn the first All-NESCAC Cross Country awards of their careers. For the women, veteran team leaders Cat Beck (Brookline, NH/Hollis-Brookline) and Katy O'Brien (North Easton, MA/Oliver Ames) both made the All-NESCAC first team. Beck was the conference runner-up with a time of 22:14.66 over six kilometers. O'Brien finished in fourth place (22:21.90) as the top seven runners were named to the first team. The two runners combined have now earned five All-NESCAC Cross Country honors. Beck has been All-Conference every year since her sophomore season, and this is O'Brien's second conference award. The Tufts women placed sixth in the race.